If you have swivel stools and are concerned about your children banging them into the counters, there’s an easy way to child-proof them by locking the swivel mechanism. Turn the stool upside down and identify the swivel plate which connects the base to the seat. It usually looks like two plates with a swivel mechanism between them. Drill a hole through both the top and bottom plates (use a drill bit made for metal), then insert a screw. 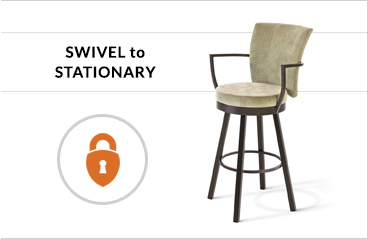 This will lock your seat so it doesn’t swivel, creating a stationary stool.